Go into any preschool and I’m sure you will find some type of sorting activity going on somewhere in the room. Why is sorting such an important skill to give to preschoolers? If you think about it, a child will go on to sort things for the rest of their life. We are always sorting, clothes, toys, papers, and the list goes on and on. Sorting is a fundamental activity in life for all. To help preschoolers learn sorting is to give them a life skill. Preschoolers can sort by shape, size, color, texture, and category. Lynne Moore also has a great sorting article. In her article “Living Skills-Sorting Groceries,” she talks about sorting helping children learn personal skills. It also teaches helpful school skills. I found this excerpt informative. Sorting activities can be a formal type of activity or something that children are doing where they don’t even know they are sorting. 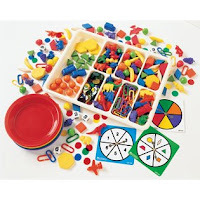 Our manipulative tables may have bear sorting, color sorting, sorting shapes, etc. Then comes the part of the day where we all sort together; clean up time. Yes, that’s right. When children clean up, there is a place for everything and everything in its place: food and dolls to the kitchen area, blocks to the block area, cars and trucks to the toy area, etc. I have been accused of being a bit OCD by people visiting my home when my children were younger. I always marked the bins or drawers that held my children’s toys. I marked them with pictures so that the children could help put them away. Did I do this for sorting? To be honest no, I didn’t want to have to obsess when the kids came to me five minutes before bed asking for that favorite toy and I wouldn’t know where it was. Okay, so I do obsess a bit. But, I digress. Unbeknownst to me I was helping the children with sorting skills. There are probably many activities you do with your child that help them with sorting skills. If you’re looking for other activities to do at home with your preschooler, here are a few: let them help put dishes away, we do silverware best, help clean up their toys, let them help put groceries away. Laundry sorting has many possibilities. First when it is dirty, let them help sort it into different piles by color, then when it is done sort it by types—shirts, pants, socks, towels, etc. ; or sort it by person—mom, dad, brother, sister, etc., lots of sorting skills here. Let those little ones help out with different activities and you will be giving them a gift they will use the rest of their lives. I love that little sorting kit in this picture. Can you tell me if it is for sale? Hi Lydia, I got the picture from google images. I looked it up and here is where you can find it. Thanks for reading.